Today has been a marathon – well, not quite, but nearly! 23.5 miles. It is too far, really, I am very tired now, and unfortunately, after the delightful B & B I stayed in I last night, my hotel for tonight is utterly repellent. However, those quibbles aside, it has been a fantastic day. 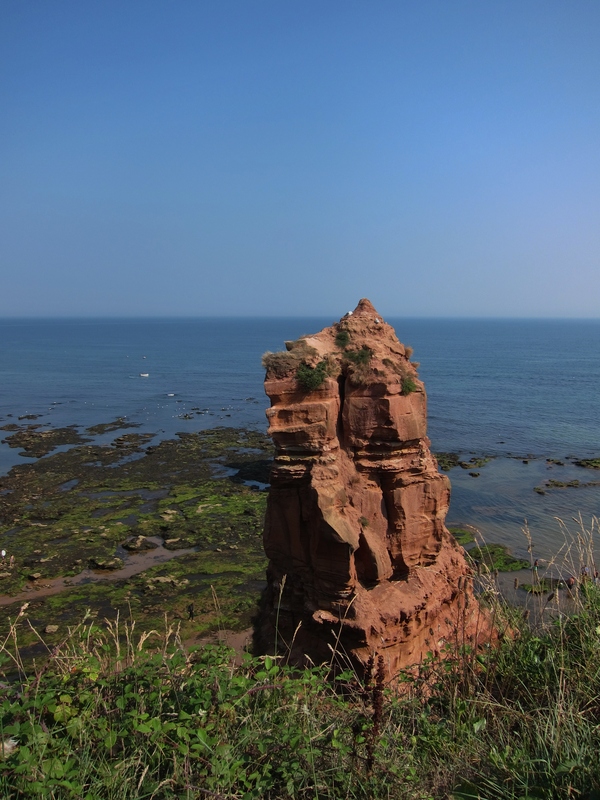 I left just before 9am, and walked along the prom at Seaton, climbing up to Beer head. It was a good pull up, but not so steep as yesterday’s first climb. 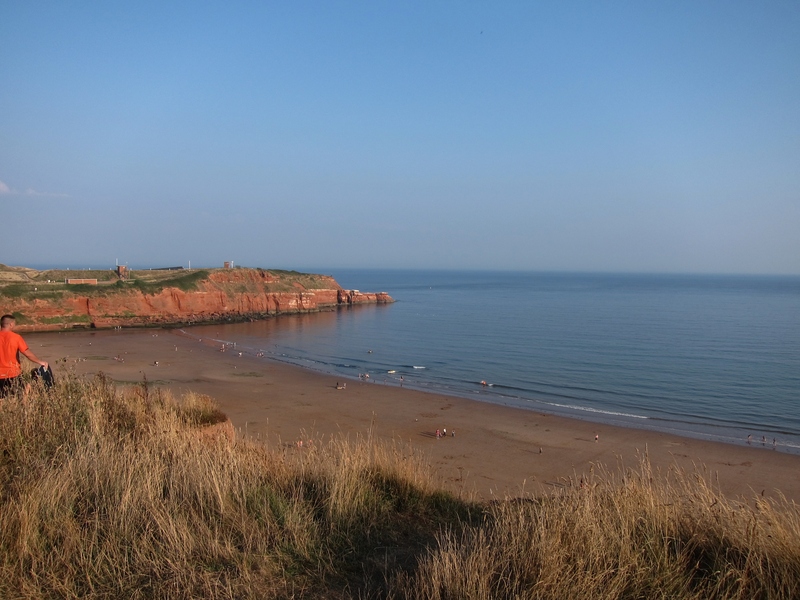 Once on top of Beer Head, there is a long grassy plateau with excellent views back down to Seaton. The path then curves around and drops steeply into West Mouth bay. It climbs up again, then drops sharply, then up again, and back down to the beach. 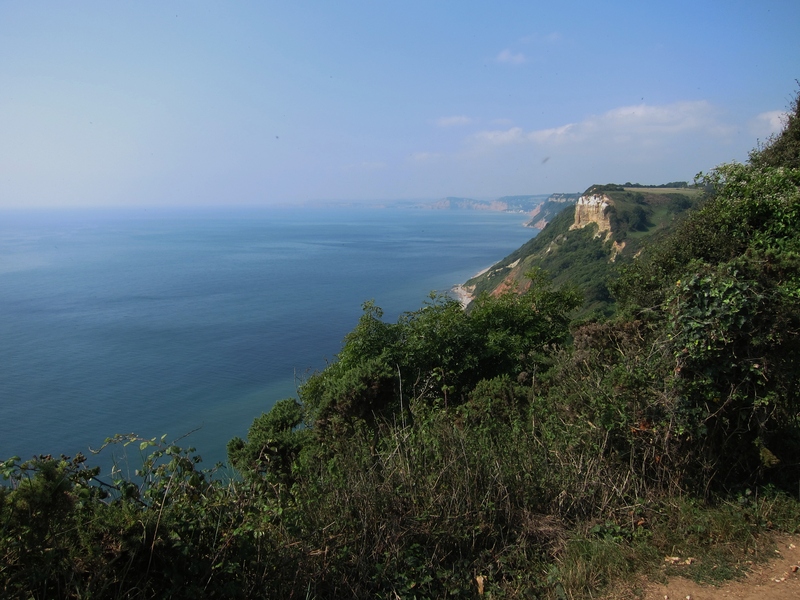 There were four of these steep ups and downs before I reached Sidmouth, which was about half way. All the people who were at Lyme Regis yesterday have moved west overnight to meet me in Sidmouth. I rested for about half an hour then climbed steadily up yet another headland which then dropped down ( there is a pattern here…. ), then another up and down, more gentle this time, into Budleigh Salterton. In Budleigh Salterton there is a long and rather tedious walk inland to the bridge crossing the River Otter, even though you can see the path not 100 yards away. I am now in an area of completely red sandstone, which, if I remember correctly from what I learnt yesterday, is from the Cretaceous period. Another climb up, more gradual this time, then a long, long descent into Exmouth, via a caravan park where a few rabbits were disporting themselves in the evening sun. The sign posting is rather confusing at this point, as I had reckoned 6 – 7 miles from Budleigh Salterton, but the sign said 4 miles, then 2 .5 miles, then back to 3 miles, then 1.75, then back to 3 miles again. All a bit confusing. In fact, it was close to 7. Exmouth seems to have the longest promenade I have ever seen, making it a very dreary trudge for the last three miles. It was an extremely warm day, which was delightful, and the boots are doing very well, although they are a trifle hot, being leather with goretex lining. Lots of butterflies today, yesterday was too windy. Saw painted ladies, large whites, small whites, green-veined whites, grizzled skippers, small tortoiseshells and even adonis blues. May have seen another kestrel, but not certain.